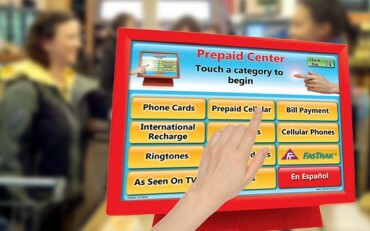 The Touch-n-Buy system is an interactive, self serve touch-screen terminal which sells a variety of pre-paid products directly from the counter or conveniently located, on a stand near the register. This system uses the 885 patent and other patent(s), to sell phone cards, ad space, bill payment, cellular phones, and pay-as-you-go cellular cards. By vividly displaying product images on the screen, this unique marketing tool exposes products to consumers in a powerful manner with no product inventory to purchase or store. Touch-n-Buy provides its customers with extensive reporting capabilities and remote updating mechanisms. Copyrights © 2019 Merchant Services, All rights reserved. Blackstone Merchant Services, Inc. is a registered ISO of Deutsche Bank, USA, New York, NY.